so a while back I bought a 13" craftsman planer(351.217130) on craigslist for $100. Sadly I haven't used it yet and I've had it for 4-5months. If I'm being honest with myself it's a healthy fear of a tool I haven't used before. so... I've read thru the manual a few times, and I think I have a grasp of how to run it but a little reassurance would help me afa courage! so... on the right it has a crank. I understand that you set this to the size you want to output... as I understand I can place my piece below the rollers and crank down while watching a 'depth of cut' pointer in the center of the unit. I understand I should shoot for 1/32 removal but should never cut more than 1/16 at a pass. accurate? anything else I need to know? what are the common planer mistakes? I plan to use it to plane down a 5/16 x 3 x 20 piece of ebony to 5/32 for a headstock overlay. with that in mind - is there a minimum thickness one can plane? I'm gonna guess that zero is not possible but what about 1/8"? for the most part I use conductive paint to shield my cavities and run a ground to a screw in the cavity and to each additional cavity to link them all. as mentioned pots should connect it to ground but over time the pots can wear off the paint or tear the tape so i like to wire it in explicitly. That said, I think you'd be fine either way. People tend to overkill the shielding but it's better to be safe then sorry IMO. for the record my hamer had ground wire running to the pot and to all cavities from the factory... I think if you look at ten mfg you'd likely find ten dif methods of shielding... all varying degrees of 'fine'. buzz - it's funny but that can mean a lot of dif things to a lot of dif people. There is the distinct buzz that comes from a single coil that is operating alone, the buzz that will be there when you aren't touching the strings (assuming no emgs), 'buzz' from emi/rf... buzz from a bad cable... a guitar that is wired perfectly correct will have some of these things so I think you just have to get a feel for when you have the right kind of buzz and not the wrong! I stand corrected. Thought for sure it was alum foil. One of these days I'm going to try that! Anywho, thank you for solving the mystery. looks really great! I don't see a run on the top at all... so I think this is one of those times where it probably is a minor thing but seems more obvious to the originator. nice work. i dunno if this helps... and I am no expert at anything(disclaimer) but I get surprisingly good results with meager tools. I first use a lam file to square the ends to the fretboard. then I use it to put a 45-67.5 deg on the edge of all frets. then i use several needle files to dress up the ends... I don't spend much time on this as I just want them to not be sharp. Once I've got them "not sharp" i use some 400 sandpaper and just hit the entire edge. Then I use cheap levels - I had to buy several to get a couple that are straight. I buy belt sander belts and cut them down. I use spray adhesive to glue on the belts to the levels. I have one in 180, one at 220, and one at 400. I mark the frets with a marker and do the 180. then I usually mark a second time and do 220. then I use 400 for cleanup. then I mark with marker the last time and crown using a stew mac tool. then I generally use a needle file to hit the sharp edge I made from leveling on the fret ends. then I use steel wool and go up through the grits. The whole process probably takes me 3 hrs spread out over several visits. I haven't done this yet but I'm told a dremel with a buffing wheel will get you a shiny surface easy - I will try that soon. what circuit did you use? ruby? the one they have here? I have thought about doing a sustainer and will when I get to doing the right guitar for it. how do you like it? any noise issues with your other pickups? hope your circuit has reverse polarity protection on it... as another thing that will smoke real good is a diode being burn out by rev power... and it's kind of fun to see (ask me how I know). looks like yer using two bat clips to extend the wire length? you prob already thought of this but note that that will flip the wires so bare end will be wrong colors... not that it matters. just lookin' out for my fellow bro! oh snap... just saw the shot where you flipped em back for the final clip. was still lookin' out for you tho! alum foil tape doesn't have conductive adhesive. I use it all the time in places where it's appropriate (control cav covers) but if you look close you can see he's using it to link cavities which makes me think it isn't. I think I see some solder marks in there which makes me think perhaps it's alum foil. I know it's fairly common to use the thicker alum foil for this. I guess we'll see when he answers. 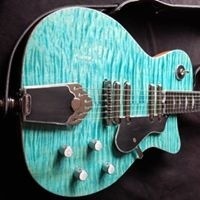 Axim guitars - 2019 projects. lovely shape. the paint job looks really great on it. nice work.